This may sound surprising but most of the questions or comments I receive on social media are about my hair. Now, the real reason why my hair is in such good shape and grows so quickly is because I do no harm to it. I’ve never dyed my hair; I don’t blow-dry it, and I only time I use styling tools is when I’m going out to special events (which is like maximum five times a year). However, I do have to give some credit to the hair products I use because they feature one of my favourite ingredients – coconut. Which stimulates hair growth, adds shine and softness to the hair and prevents breakage. Plus, did I mention that it smells delicious? 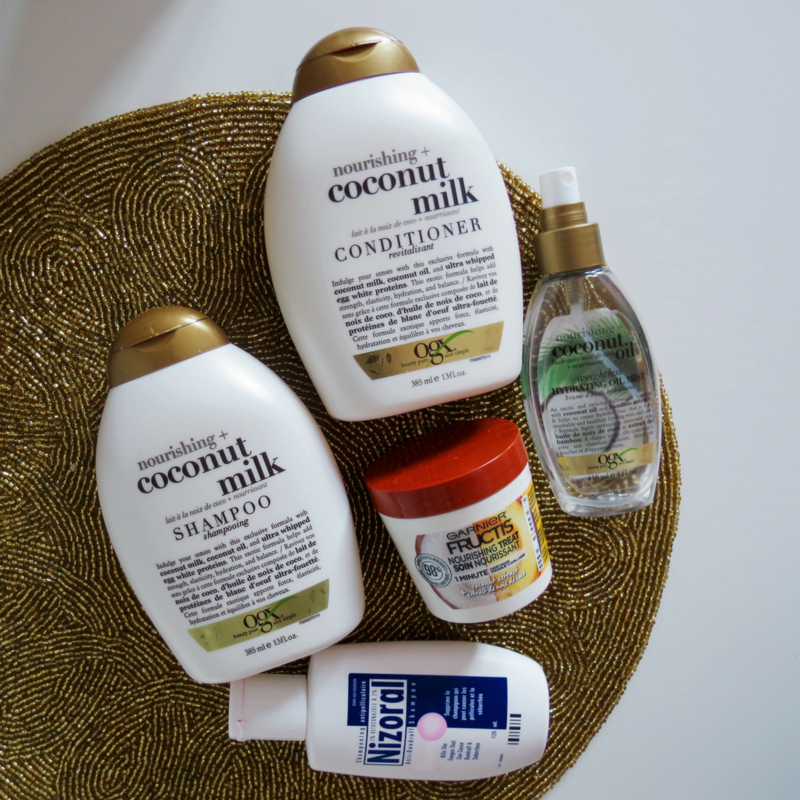 Anyways… Here are the hair products I use and how I use them! Ever since a young age, when I feel stressed I experience flare-ups of mild psoriasis on my scalp. To help with the burning scalp sensation, I put a dime size amount of treatment in my shampoo and use it as a preventative. If you experience psoriasis on your scalp, I recommend using a shampoo with ketoconazole. I’m tired a lot of OGX shampoo and conditioners sets because they produce the best hair care products available at drugstores. I love their shampoos and conditioners because of their ingredients, creamy consistency, and how they are sulfate free. Thank you Glam Sense for sending me this hair mask to review. 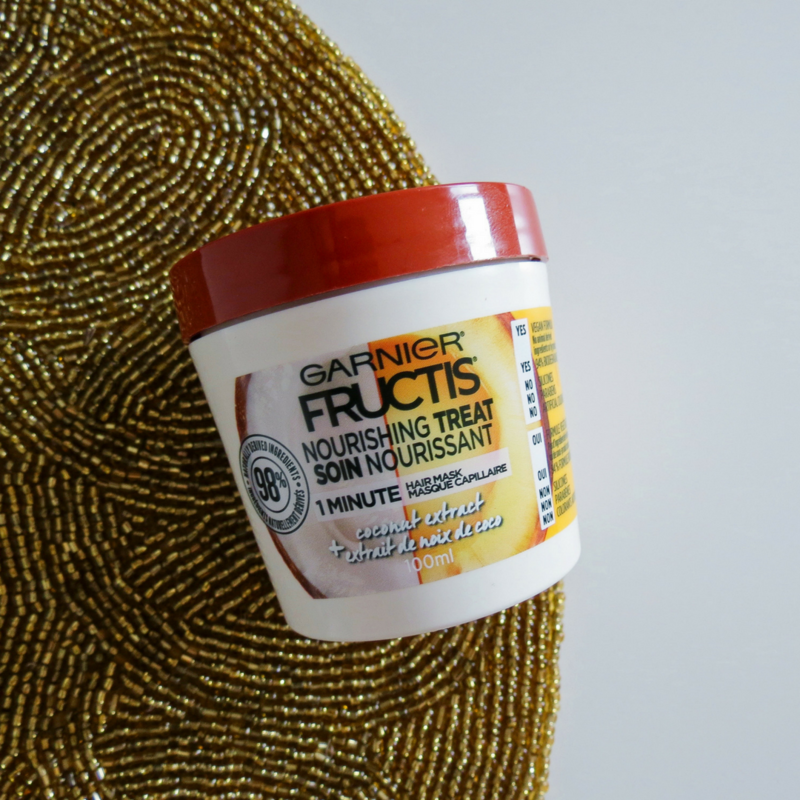 The Garnier Fructis 1 Minute Hair Mask has an even thicker consistency than my OGX conditioner, which feels so nourishing and protects the end of my hair. I also adore the scent and safe ingredients. 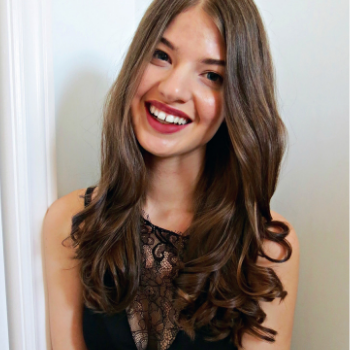 I love using hair oils because it gives your hair a healthy shine and can be used as a de-tangler. I also think of these hair oils, as ‘hair fragrances’ or ‘hair perfumes’ because it leaves a long lasting scent on your hair throughout the day. Apply a dime size amount of Nizoral Anti-Dandruff Shampoo onto my scalp and massage it in. Add a loonie size (1 dollar coin) amount of OGX Nourishing + Coconut Milk Shampoo throughout my hair and then rinse. Add a loonie size (1 dollar coin) amount of the OGX Nourishing + Coconut Milk Conditioner to the ends of my hair and rinse. Apply a loonie size (1 dollar coin) amount of the Garnier Fructis Nourishing Treat 1 Minute Hair Mask Coconut Extract to the ends of my hair. I then wait one minute and rinse. In the morning, I spritz OGX Nourishing + Coconut Oil Hydrating Oil Mist onto my hair brush and then comb it through my hair. Thank you for reading about my coco(nutty) hair care routine and thank you to Glam Sense for the Garnier Fructis Nourishing Treat 1 Minute Hair Mask Coconut Extract. If you are interested in any of the products, click the links throughout the post or in the widget bellow!